Derek Senn works as a commercial real estate broker at Anderson Commercial Real Estate, 798 Palm Street, San Luis Obispo. He has been working in the San Luis Obispo market since 1998 and represents owners and tenants in all categories of commercial property. Do not hesitate to call for assistance with any of your commercial real estate needs. Past clients include: Meathead Movers, REC Solar, Lindamood-Bell Learning Processes, Guayaki, Straight Down Sportswear, Ernie Ball, LaVerne University, Countrywide, Cuesta College, San Luis Sports Therapy, CCPN, Cygnet, Charter Communications, UBS, Robert Mondavi, Ashley-Vance Engineering, Dioptics, John Wallace & Associates, Lezyne, iRobot, Mind Body, Blakeslee & Blakeslee, and the Apple Farm. Derek is also a very active husband, father and musician. His boys Diego and Charlie, ages 6 and 5, are rambunctious and create just enough mayhem to keep Derek constantly teetering on the knife edge of exhaustion and insanity. Derek’s wife, Melanie, is an English lecturer at Cal Poly. Derek’s interest in music cannot be suppressed. Believe us, he has tried every avenue to exorcise the musical demons and all have failed. He is a songwriter, guitarist, and singer and can be found plying his trade after hours at various watering holes along the Central Coast while under the cover of various monikers. Keep an ear out for his particular style, which is often referred to as a byproduct of the conflicted love child of Ted Nugent and Ani DeFranco. 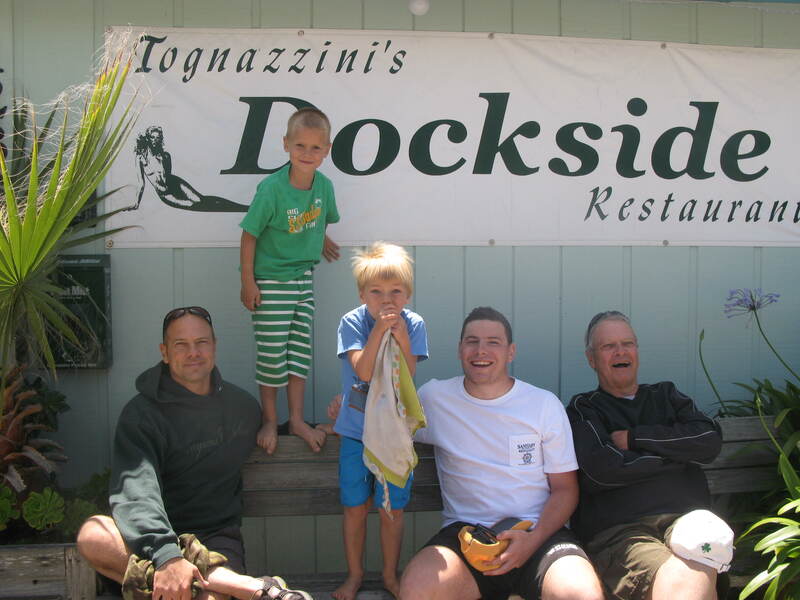 Derek (left) with his sons Diego and Charlie, cousin Sean Dundon, and father Charley.